“Seeking the Sacred is like a chalice of wisdom. 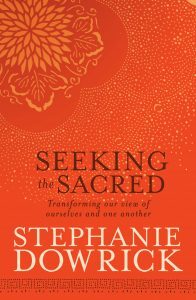 It overflows with inspired and inspiring quotes and teachings…Through it all is Stephanie Dowrick’s distinct voice.” Claire Scobie, Sydney Morning Herald Whether you are a spiritual seeker or simply curious, Seeking the Sacred is a book that speaks to your deepest longings and needs. It also affirms a view of humankind that is at once inclusive, uplifting and respectful. The inclusiveness and depth of this book brings a much needed change in perspective to the highly contemporary religion debates. More powerfully and personally, if affirms each reader’s desires to live a life that is meaningful, connected, healing and rewarding. Stephanie Dowrick regards this as the book she has needed almost three decades of writing, thinking and spiritual exploration and practice to be ready to write. We believe it is also a book that countless people have been waiting to read. For more background, Stephanie Dowrick answers ‘Ten Terrifying Questions’ for the Booktopia blog.